Worried that your Xbox 360 isn't properly blinged out? Microsoft has you covered. Courtesy Microsoft spokesperson Larry "Major Nelson" Hryb comes word that the company is set to debut a line of "Chrome" controllers for the Xbox 360. No, they aren't made of metal, they're just really shiny. Today we're announcing the Xbox 360 Special Edition Chrome Series Wireless Controllers. 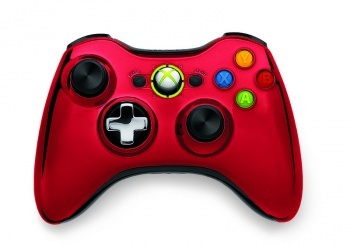 Available in Blue, Red and Silver these controllers also feature the transforming D-pad. The controllers will have an estimated retail price of US $54.99 each and will be available mid-May. Color availability will vary by region, so please check your local retailer for specific information or visit xbox.com/accessories for more details. First, that "transforming D-pad" mentioned above is a neat little feature that allows the Xbox 360 standard directional pad to switch between either a four-way cross configuration or a circular layout. It's a comfortable, if not entirely foolproof, fix for those gamers whose thumbs are blistered from hours of playing fighting games on Microsoft's console. Second, that $54.99 price tag is $5 more than the standard wireless controller price point. Presumably that's the exact amount of money required by Microsoft's PR team to stretch the meaning of the word "chrome" to include shiny red plastic. Hryb's blog post also includes a link to a photo gallery of the upcoming controllers, and literalist sarcasm aside, these new controllers do look very pretty. I leave it to you whether they're worth the extra scratch, but those of you hoping to blind opponents mid-match may want to make the investment.